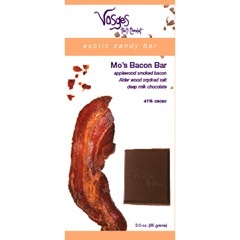 Special thanks this morning to my friend Dena who pointed me in the direction of something that was probably made with my pyschographic profile in mind - bacon flavored chocolate! What’s different about this is that the actual hamburger patty is made from ground bacon. 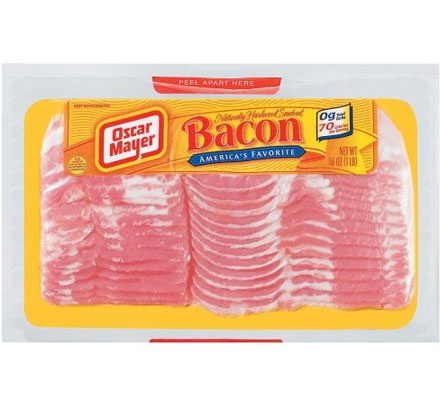 Bacon: it's not just for breakfast anymore. In fact, it's for dessert! Check out these mouth-watering high-cholesterol desserts. Smoked Bacon and Egg Ice Cream. According to The Sun, which is always reliable in topics of no import, scientists have determined the precise formula for the perfect bacon sandwich. Of course, it was hard work. They probably got a grant for it, too. 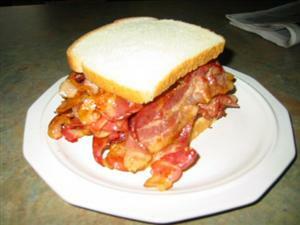 Four scientists at Leeds University spent more than 1,000 hours testing 700 variations of the traditional bacon buttie. Now that’s some research I can wrap my tongue around! It’s not made of bacon, it just looks and smells like bacon. Constructed of chemically-treated latex. For a memorable prom, wedding, or award ceremony. Dry clean only. From Archie McPhee. For Scaramouch: How to make healthy, air-popped popcorn into something worth eating. 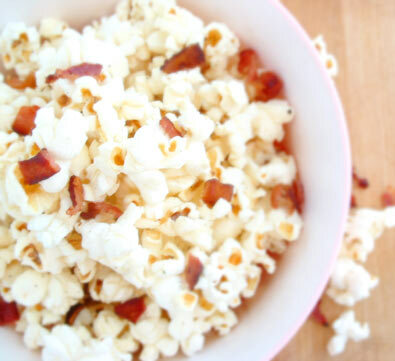 Bacon Popcorn. Possibly the best lager in the world? Skittles! They're the Bacon of Candy!